Kovan is home to many good but underrated food. 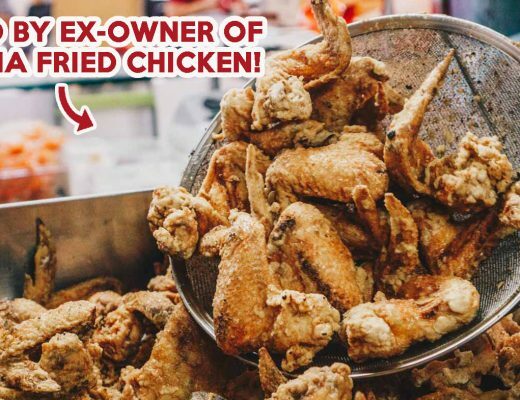 However, with the renovation of Kovan Market & Food Centre, a whole chunk of good food has been stripped off the list for North-East dwellers. 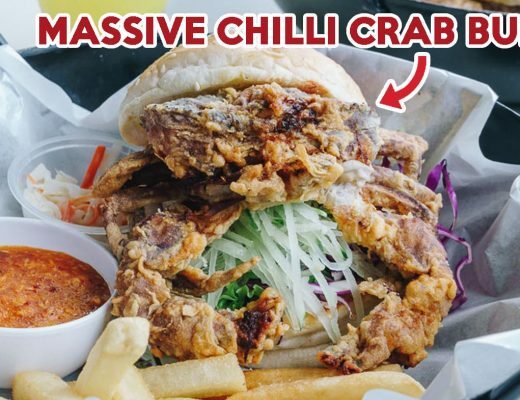 Not far from the food centre is Knuckles Bistro. 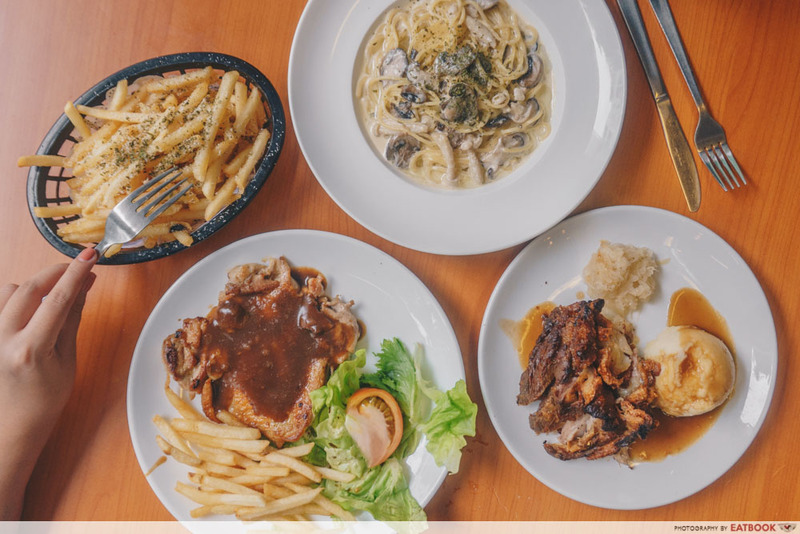 Opened by the same people behind Nakhon Kitchen, they serve an extensive menu of German dishes. 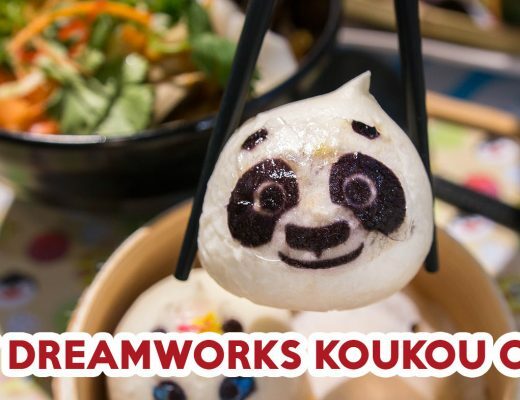 They might be a tad messy with the plating, but don’t let that turn your appetite off. 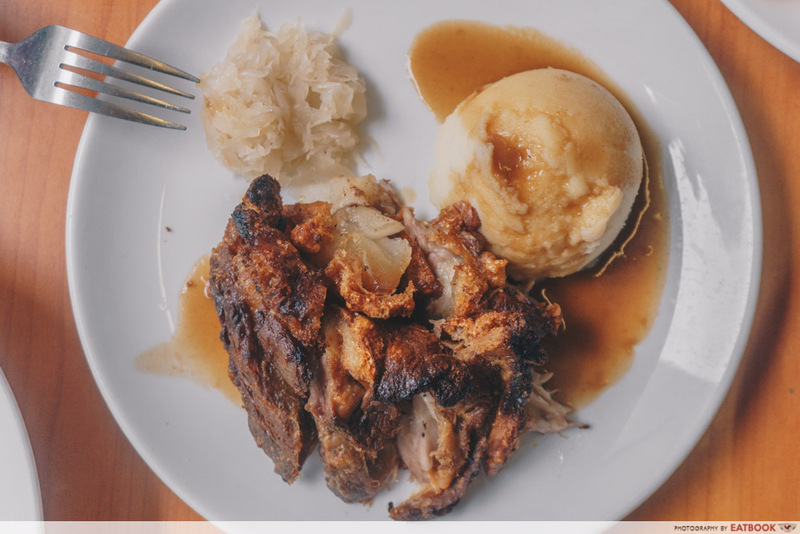 One of the most affordable plates of German Pork Knuckles ($10) in Singapore, this comes with a generous amount of pork knuckles, a scoop of mashed potatoes with gravy, and a dollop of sauerkraut. I’m a huge fan of all things pork, despite eating a fair share of overly dry and tough ones. The one here was thankfully tender and sufficiently moist. 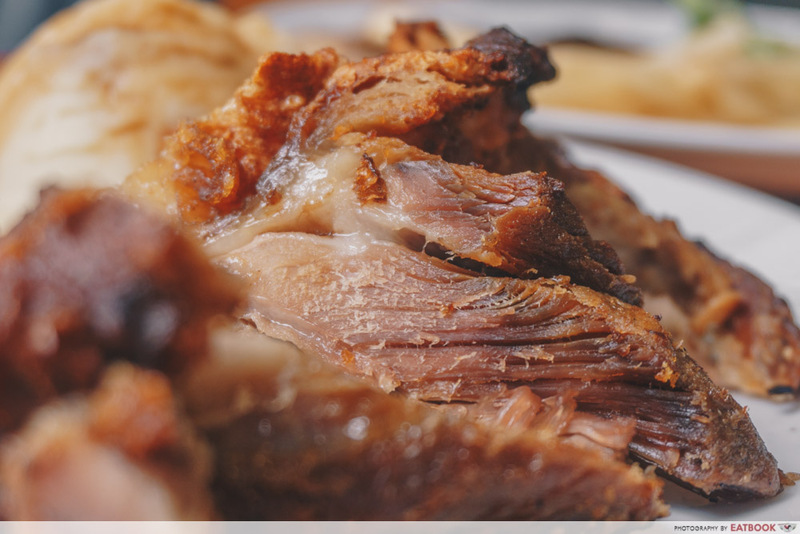 Even though we left the dish out for more than 15 minutes, there was still a resounding crunch from the pork crackling, which was pretty much the star of the dish. 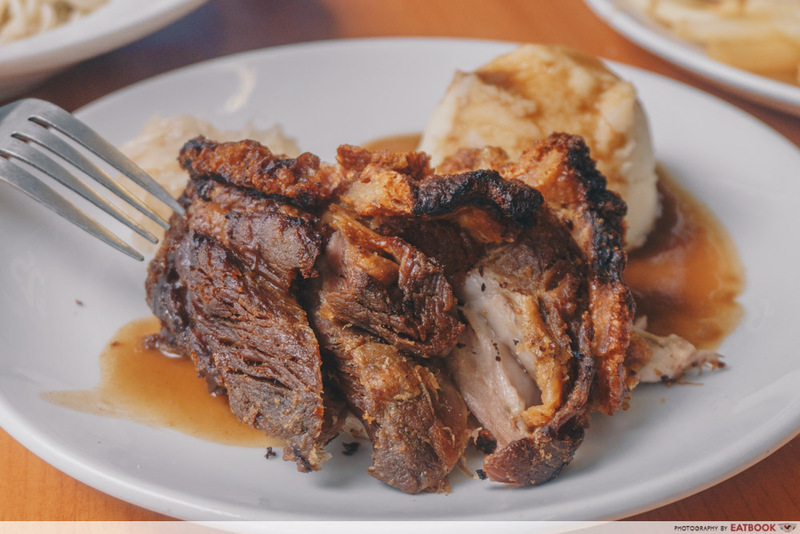 It might not be the most delicious plate of pork knuckle I’ve ever had, but at just $10 you are definitely getting a bang for your buck. 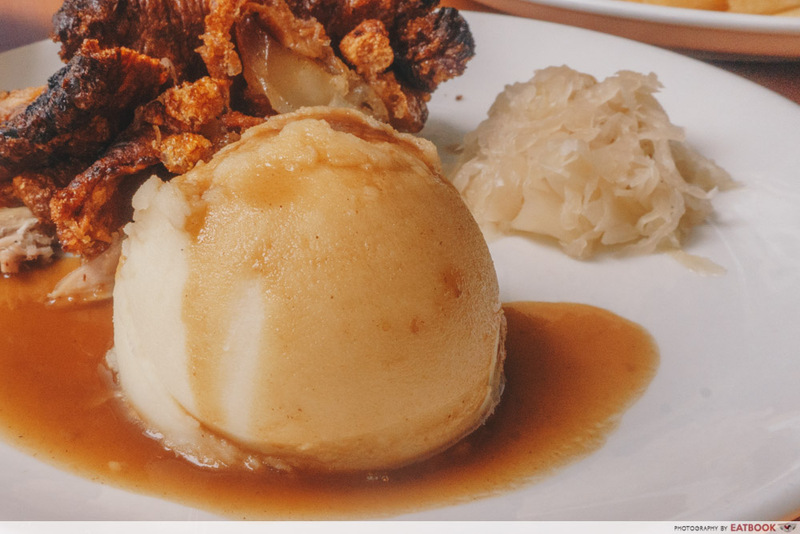 The sauerkraut here was nicely tart and aromatic, balancing out the fatty and slightly greasy pork knuckle. On the other hand, the mash potato and gravy was a disappointment. It tasted under seasoned and one dimensional. Even a noob cook like myself could probably do a better job. I was pleasantly surprised with their Grilled Chicken Chop ($8). 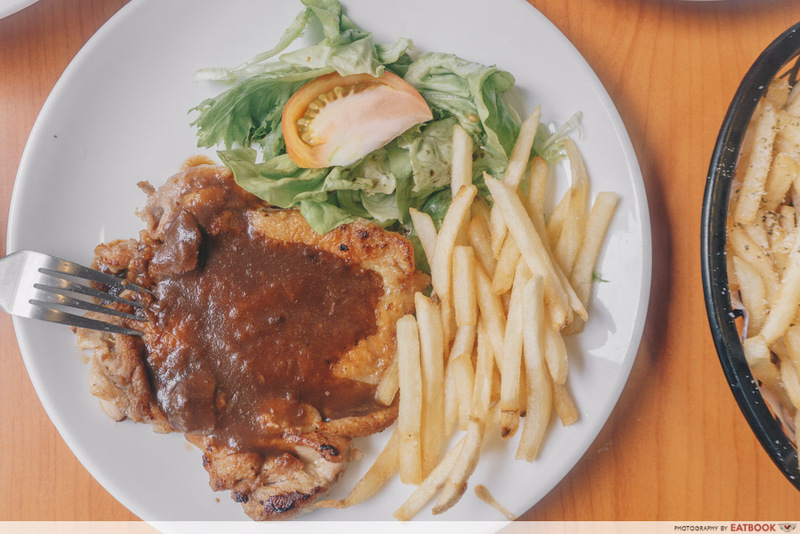 The chicken chop here rivals Astons’ chargrilled chicken in terms of taste and quantity. Juicy is the chicken under the crisp skin, which had a good Maillard–brown sear to it. The sauce poured atop was also flavourful with a kick of spice from black pepper. The smell of the chicken says ‘home’ to me and the plate was one I could easily finish in one sitting. There were reviews online raving about their truffle dishes such as Truffle Mushroom Pasta ($8) and Truffle Fries ($6), so we had to try them for ourselves. 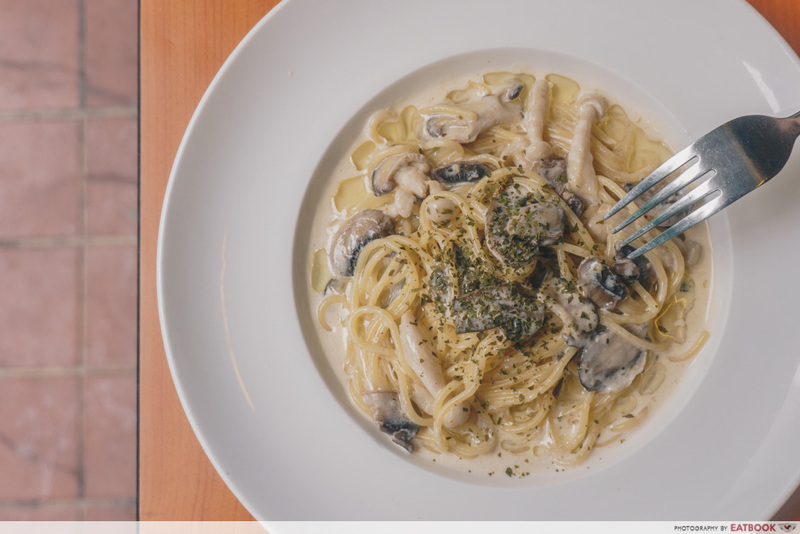 As soon as the plate of Truffle Mushroom Pasta arrived, we were engulfed by the aromatic essences of truffle. 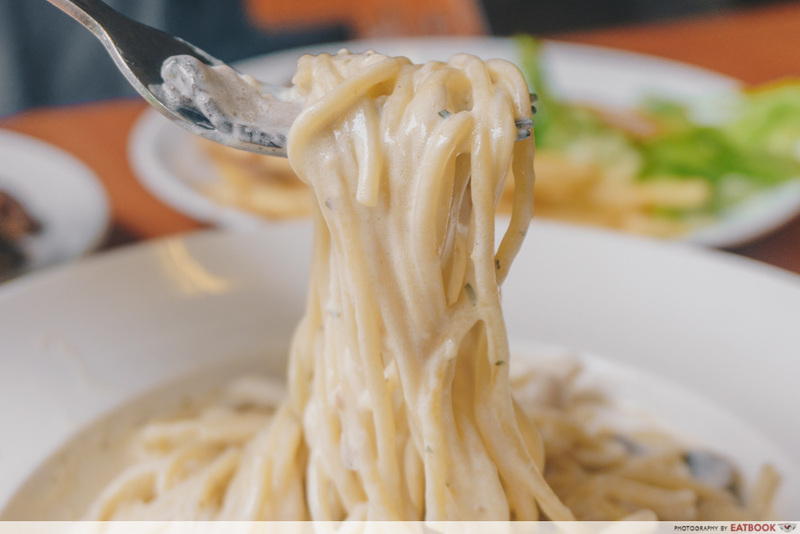 It was evident that truffle oil was generously drizzled atop, as there was oil pooled at the curves and bends of the spaghetti noodles. Mixing the glorious-smelling plate of pasta up only further enticed me to wolf down the dish. There were three kinds of mushrooms used – white button mushrooms, shimeji mushrooms, and shiitake mushrooms. 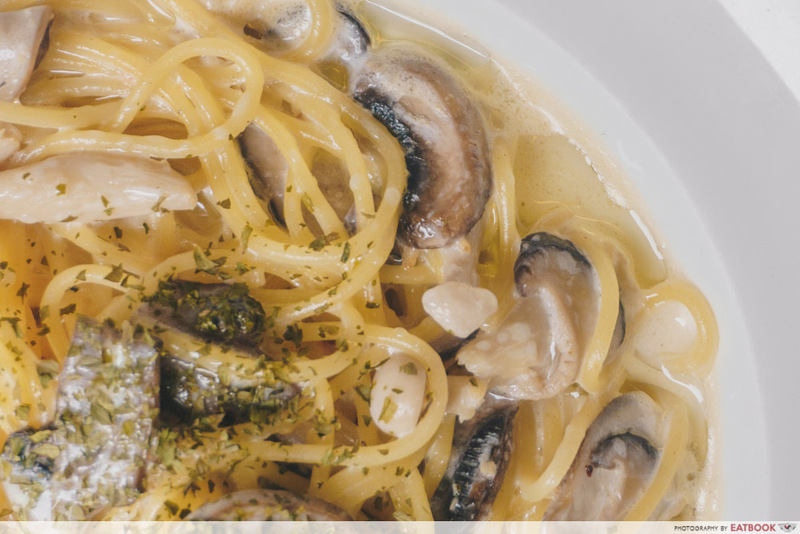 The white cream evenly coated each strand of spaghetti and mushroom, tainting everything it touched with the taste of truffle. If you love all things truffle, this is definitely a must-order when in the area. I can’t say the same for the Truffle Fries though. We might have been spoiled truffle-silly by the Truffle Mushroom Pasta, as there was barely any traces of truffle for the fries. 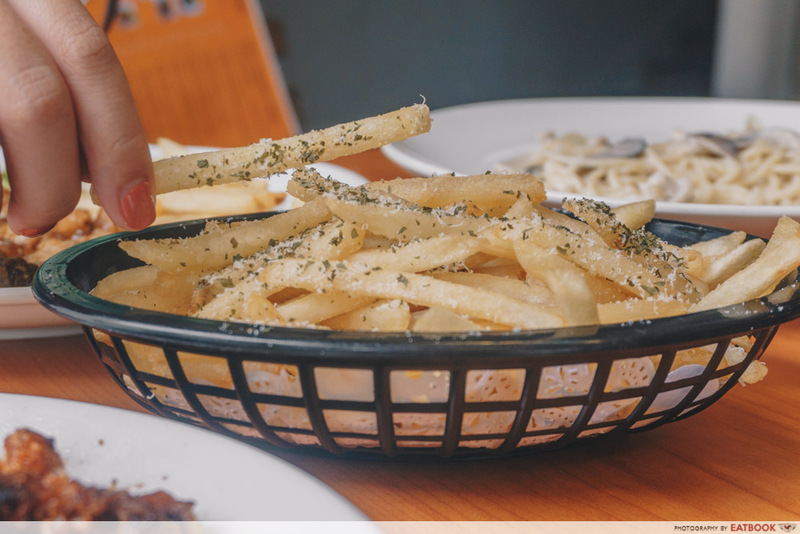 It could easily pass off as a basket of normal fries. For $6, the portion was considerably small as well. Spacious with rustic countryside vibes, Knuckles Bistro makes for a great place to bring your family or hold large group gatherings at. Sharp elbows are required at night, as the eatery tends to get crowded for dinner. But you need not worry about the waiting time or getting a seat if you’re coming here for lunch. All three mains we tried had us vowing to return. The prices were reasonable and flavours were mostly on point. 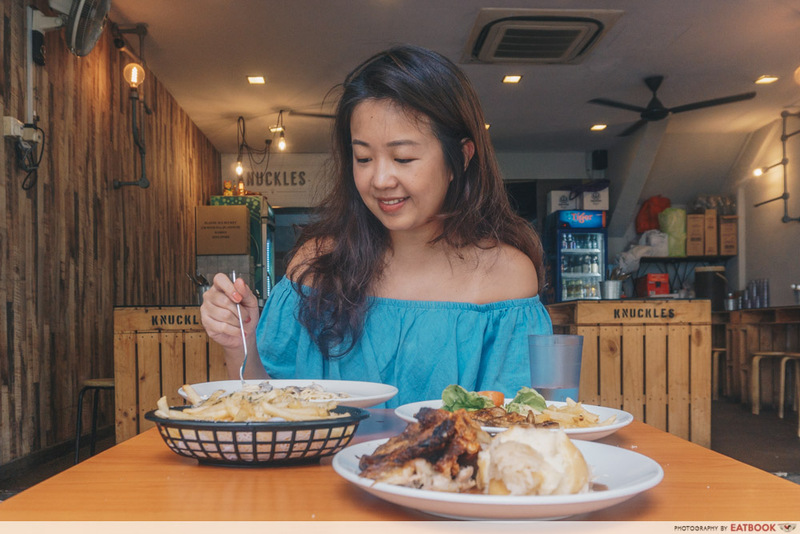 As a Westie, Kovan isn’t somewhere I’d usually venture but if the north-east is your hood, I recommend heading down to give Knuckles Bistro a try. 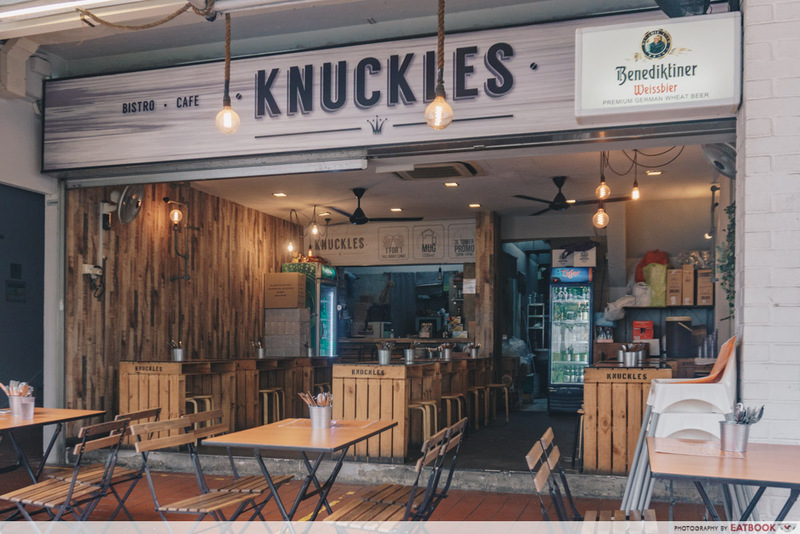 Knuckles Bistro is not a halal eatery.